Sunday was the big day. We’d paid a lot of money to have the opportunity to get an autograph and a photo op and preferential seating for a panel with Chris Hemsworth. Hemsworth was one of the stars of Joss Whedon and Drew Goddard’s The Cabin in the Woods, which we got the blu-ray cover signed for. He went on to become the God of Thunder, Thor in the Marvel Cinematic Universe and although I didn’t realize it, he also played James T Kirk’s father in the 2009 remake of Star Trek. We got in early using our VIP status and headed to the Hemsworth booth and queued for his autograph. The signing would take place at 11AM, which turned into 11:10AM and Hemsworth being escorted to his booth by Wizard World CEO John Macaluso. It was a huge deal. Hundreds of people swarmed around to catch a glimpse and a bad cell phone photo of Hemsworth. I turned my cell phone toward them and snapped their photos in ridiculous spots trying to angle to get their best view through the VIP queue I was already standing in. I liked that Chris smiled when he saw the Cabin blu ray cover. I have no idea if he said anything other than thanks for coming. My wife got a Thor photo from the complimentary 8x10s they provided signed. I don’t know if they had a conversation at all. I can just say, Hemsworth is really tall. 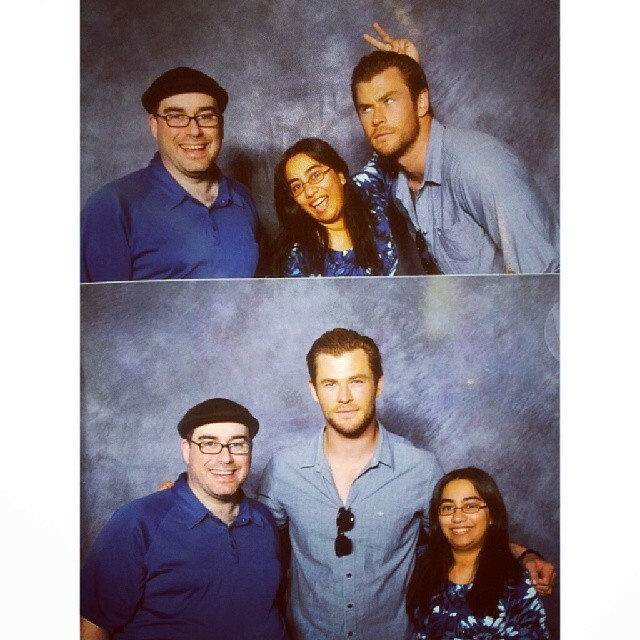 We headed straight to the Chris Hemsworth photo op queue and had two shots with him. Our first one is a normal pose, but the second was awesome. My wife asked if she could give him bunny ears. He said sure and bent down and gave a quizzical look. I love that shot. I’m really glad we got two photo ops with our VIP tickets and that picture alone made the silly and expensive vacation a few hours north worth it for me. We snuck away to the Hyatt to recompose ourselves after the photo op and ate hot dogs and split a strawberry banana smoothie from an outdoor concession tent next to the convention center as a quick lunch. After lunch, we picked up our photo op photos, which were as awesome as I expected and we waited in a somewhat long line to redeem coupons for digital copies of the photos that we had paid for. That being the “worst” logistical situation we found ourselves in, I have to say that despite line control issues getting worse as the weekend went on instead of better, and the volunteers all being clueless, the convention was well booked and the artists and actors given a level of freedom you just don’t see at other conventions. We headed upstairs and got seats toward the back of Ballroom 203. We sat through a Boondock Saints discusion with David Della Rocco and Sean Patrick Flannery and a mostly Walking Dead discussion with Jon Bernthal before shifting to the end of the row for the Stan Lee panel. Macaluso again appeared, to thank everyone for making the first year convention in Sacramento a huge success. They are bringing the show back to Sacramento TWICE in 2015 due to the response they got. He also mentioned that due to illness, Stan Lee’s panel would be shorter than his usual panels. We all understood. Stan Lee did the best he could under the circumstances and didn’t seem to want to leave the panel at his scheduled time. He did, after taking a couple more questions but it is amazing to me that a man 91 years old can still have the fire and creativity and willingness to travel so much that he does. What an awesome man! We got a couple of exclusive clips of The Amazing Spiderman 2, which is a movie I don’t care to see, as we moved to the front for the Hemsworth panel. We ended up seated in the front row, directly in front of Chris for the panel. Hemsworth’s responses made him out to be just as much of a pop culture nerd as the rest of the room and just like other actors that play superheroes, when small children ask questions directly to the character, he maturely responded as the character would. That’s another thing I really liked about the convention. In addition to giving a lot of focus to comics, the thing Comic Cons were intended to be about, Wizard World also caters to a great demographic. Children 10 and under gain free admission and the right to free autographs and photo ops with the stars. They get preferential treatment if they want to ask a question and it really sets a much higher quality dynamic. I can accept a kid asking about why Loki would want to fight his brother a lot more than a woman seemingly in her forties asking Hemsworth to take off his shirt. The Hemsworth panel ended and he exited and the show for us ended with two other guys dressed as Thor getting on stage and snapping some photos. Not with Hemsworth, he’d been whisked away. We had a nice award winning Margherita pizza at Pizza Rock for dinner and dessert at a hole in the wall called Vanilla Bean across town. It was a good end to the vacation. I’m looking forward to the lineup for next year and would definitely consider revisiting Sacramento for one or both of next year’s Comic Cons.